There has always been something ultra cool about Maureen “Moe” Tucker. Starting back with her days as the “girl drummer” for the Velvet Underground. The slightly androgynous presence that countered Nico’s icy glam girl and the VU boys’ downtown hipness. Then she moved away from NYC to have a (relatively) normal family life, living in Arizona and Georgia and having a day job although never fully giving up the music. I have a cherished 45 of her covering “Around and Around” and “Will You Still Love Me Tomorrow.” It was lo-fi before lo-fi was popular. 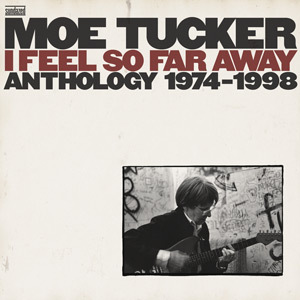 Tucker talks/sings these classic songs to a spare, elementary arrangement that is only a few steps above the infamous Shaggs – but captivating in its own way. Tucker’s releases have been scattered and I really haven’t kept up on it. But coming next month is the first ever Moe Tucker anthology. Those wonderful archivists at Sundazed have compiled a 32-track double CD collletion that covers 3 decades of her solo music-making (there is also a 3 vinyl album version that has fewer tracks). The set’s songlist includes an intriguing selection of originals, covers and renditions of old Velvet tunes. I Feel So Far Away – Anthology 1974-1998 has a March 27 release date. This entry was posted in Music, and tagged I Feel So Far Away, Moe Tucker, Nico, Sundazed, Velvet Underground. Bookmark the permalink.